Unlike many Americans, who wake up on Memorial Day thinking about backyard barbecues and family gatherings, we awoke to the sights and sounds of Buffalo Valley, east of the Teton Range. Thought to be some of the youngest mountains in the world, the Tetons were formed when earthquakes caused the mountains to rise and the valley to drop. Subsequent glacial movements eroded the landscape and deposited rocky debris, carving peaks and canyons and creating pristine lakes. Our campsite gave us views of the Snake River that meanders through the valley floor, vast meadows with hundreds of grazing horses and livestock, sagebrush flats, dense forests and, of course, the magnificent peaks. It also provided a natural soundtrack, with ducks quacking, birds chirping, geese honking and horses whinnying. Unfortunately, the morning glory of Day 4 found us transported from the sublime to the mundane, as it became necessary to do three loads of laundry. Days of rain produced many wet towels and soiled dog blankets that required cleaning before our advance on Yellowstone. After enjoying a hardy breakfast, we finally hit the road for the two-hour trip to our Fishing Bridge campsite. The drive along winding mountain roads provided striking views that provoked wonder. As we made our way across the continental divide and into Yellowstone, we were absolutely mesmerized by the power and beauty of this volcanic wonderland. Everywhere is evidence of Yellowstone’s volcanic past. The park’s central basin, where our campsite was located, is still powered by magmatic heat, which accounts for the myriad geysers, hot springs, fumaroles and mud pots. More about those mud pots in a later post. Our first stop: Fishing Bridge RV Park, located along the northern shore of Yellowstone Lake, the largest high-altitude lake in North America at about 20 miles in length and 14 miles in width. With an average depth of 140 feet, its deepest spot is 410 feet. Fishing Bridge was originally a rough-hewn log structure built in 1902 over a major spawning area for cutthroat trout. The current bridge, built in 1937, was closed to fishing in 1973 (due to the decline of the cutthroat population) but the moniker remains. Today, Fishing Bridge is a popular site for viewing fish. We chose the Fishing Bridge RV Park because it is the only campsite in Yellowstone that provides full hookups. Parking at site F229 was the most challenging task to date. Soon after we hooked up and settled in, we discovered that we were completely off the grid: No cell service, no WiFi, no radio or TV reception. Absolutely no connection to the outside world. So we headed into Lake Village to ask about AT&T service. We were told that Verizon had the best coverage in Yellowstone, but it might be possible to access AT&T in Canyon Village, some 20 miles north. So we set out to establish contact. 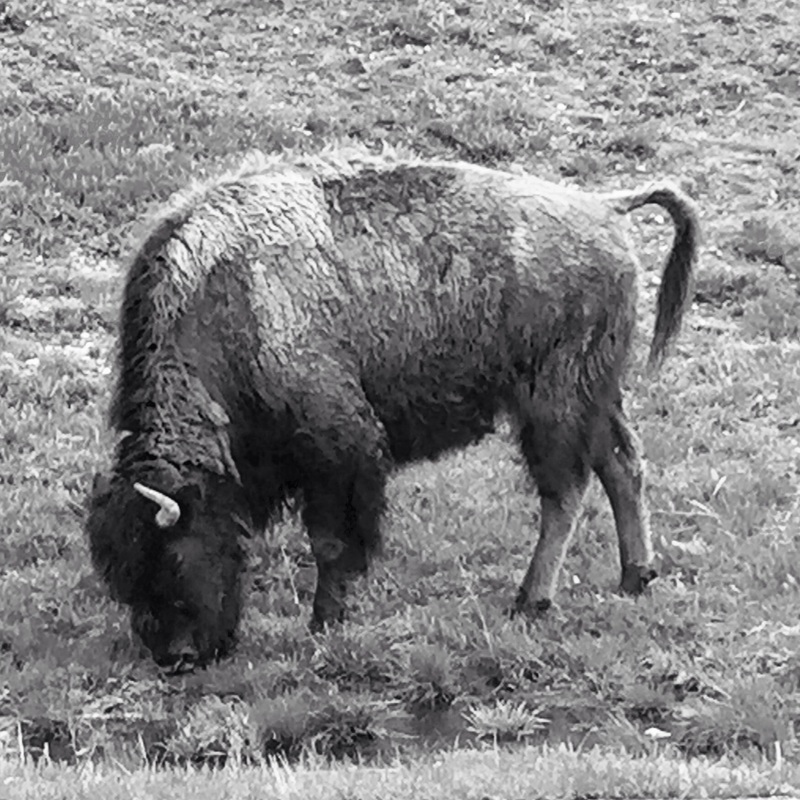 En route, we got up close and personal with some bison grazing near the roadside. Oddly, at that precise moment, we picked up AT&T service. So we made some Facebook updates and a couple of calls. But without WiFi we could do little else, such as download music or video for later enjoyment. Cliff suggested the bison be turned into WiFi hotspots because they’re already great cellphone towers. A little further on, we encountered a pack of “bearparazzi,” dozens of wild-eyed people with cameras and tripods and telephoto lenses on the lookout for bear. It seems a single black bear, spotted some distance away, caused not only a frenzy among the bearparazzi but also a road block for drivers. Park rangers were called in to manage the situation, and when the bear began to run, the entire pack of photographers made chase. The scene was quite comical. Cliff managed to capture a couple of images on his cellphone, no tripod or telephoto lens required. Finally, at Canyon Village, we experienced Yellowstone’s version of the strip mall. The area featured a visitor center, a sporting goods store, a cafeteria, a bakery, a lounge and a restaurant, and several gifts stores. But none had WiFi. So, we returned to Cloud 9 to spend a very quiet evening with only the rain to provide accompaniment to our dinner of grilled lemon chicken, peas and charred peppers. Even in the midst of this vast wilderness, it felt like home. First, as service providers go, AT&T is a profound disappointment. In this day and age, when cellphone towers can be disguised as trees, AT&T should have better covereage of a national park that attracts more than 3 million visitors annually. Second, the National Park System needs to provide WiFi at least in the busiest areas. People like us who, want to stay connected, will be more than glad to pay for the service. Third, chipmunks are distinct from ground squirrels because the former have three stripes down the back and the latter have two. Both, however, have moments of cuteness. May 26, 2015 in Adventures, Cloud 9, Destinations.